DUMBARTON lost a crucial home battle with derby rivals Morton in front of an 1,110 crowd at the Cheaper Insurance Direct Stadium. The 2-1 defeat meant that they dropped to second bottom of the Ladbrokes Championship table on goal difference, level with St Mirren and Livingston on 10 points and five ahead of Alloa Athletic. Sons had chances in a rather nondescript first half, but it was Morton who took the lead four minutes from the interval when keeper Mark Brown beat out a shot, but Joe McKee picked his spot. In the gathering Halloween gloom in the second half Sons upped their game and equalised quickly when a Willie Gibson free kick broke to skipper Darren Brown, and he shot home. Both sides went for the victory, and it arrived five minutes from the end when a disastrous mix up at the back on 85 minutes allowed Morton's Denny Johnstone to turn the ball into an empty net for the winner. 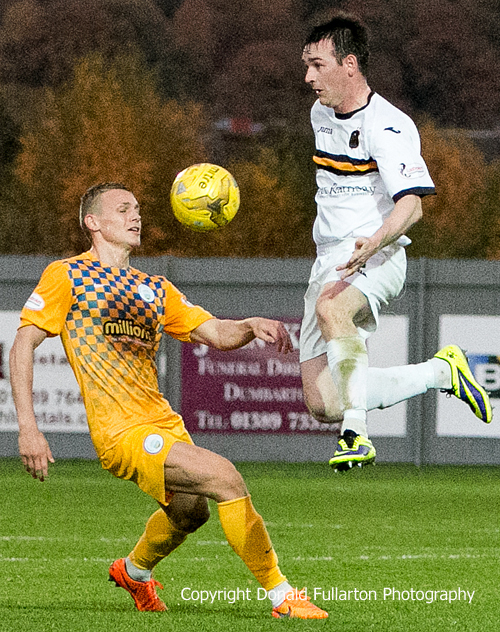 The picture shows Sons full back Mark Docherty leaping to control the ball.